A large business situated on a promenade which had previously been flooded due to the combination of strong winds and high tides. We were asked to supply a solution at short notice that could be deployed and left out on a semi-permanent basis (winter months) to ensure the building is protected from future tidal flooding. FloodBlock was the perfect solution. Once deployed it is extremely robust. Like all of our flood barriers, FloodBlock is secure when deployed, vandal proof and not adversely affected by strong winds when in place. The system also highly visible. Any sections along the 60-metre barriers length can be removed for easy access into the building when required. Flooding caused by tidal flooding is an increasing issue. The UK suffered major sea tidal flooding in December 2013. A tidal surge hit many parts of the UK, especially the East Coast. Thousands were forced to leave their homes as tides in parts of the North Sea reached higher levels than the devastating floods of 1953. Many communities were affected including in Great Yarnouth, Lowestoft and Humber. 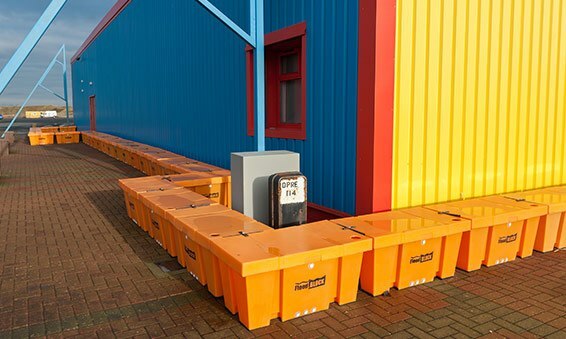 FloodBlock and Floodstop is an ideal solution to mitigate against tidal flooding due to its robustness when deployed.